According to Ayala (1978) during colonisation, the coast was a region of secondary agriculture where colonialists divided the land into subsistence smallholdings next to indigenous communities. As colonisation progressed, this accelerated the disappearance of the indigenous populations through epidemics, illness, escape etc. In the middle of the 17th century colonialists began growing tobacco, cotton, rice and particularly cocoa. In the 18th and 19th centuries, the growing importance of these monoculture crops, together with new markets, stimulated the formation of coastal “latifundios” (large, private landholding or hacienda), taking over the smaller properties. One of the difficulties which these large plantations faced was a lack of labour and for this reason, the work attracted indigenous people from the Andes, who migrated to these large haciendas, attracted by the stable salaries and in this manner, the mestizo ethnic group developed (mix of black, white and indigenous). In this way, differences grew between the Andes and the Coast. 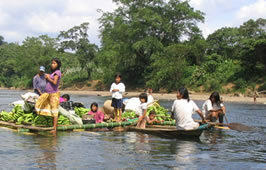 In the Coast, agro-commercial activities were linked to external markets and in the Andes, production supplied the internal market. This resulted in more complicated cultural relationships which exist to this day. Editorial Abya Yala / Quito-Ecuador / 1992 / pp. 195-204. 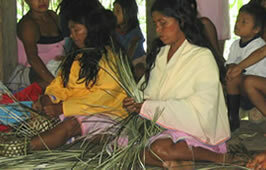 The four ethnic groups of the coast, the Afro-ecuadorians, the Chachis, the Tzachilas and the Awa, achieved survival with relative autonomy; however, in the last thirty years, they have been caught up in an accelerated process of integration which has produced substantial changes to their traditional way of living. 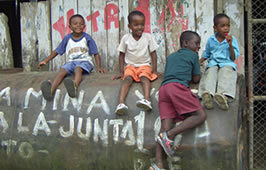 The presence of black people in Ecuador dates back more than 400 years, originally brought from countries on the West Coast of Africa including Angola, Nigeria, The Congo and New Guinea... read more. Also known as Cayapas, these people are found in the west of the Esmeraldas Province, with a current population of 4,000 people. According to Carrasco (1983-1984) ... read more. The Tsachilas are located in the south west of the Pichincha Province in the central part: a region known as Santo Domingo. This zone is characterised by fertile soil, abundant vegetation ... read more. The Awa, also known as Qualquier are located in the northern Oriente between the Mira and San Juan rivers in the Carchi Province. 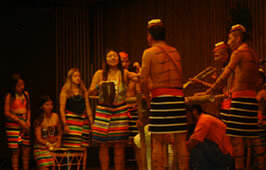 In addition there are also Awa communities in the Imbabura... read more.